The tiger, India’s National Animal, is still highly endangered despite decades of conservation. Government estimates reveal that there may be fewer than 2000 left. Why have India’s tigers declined so drastically? What exactly are the problems facing their conservation? And are there any solutions to the crisis? This film has the answers. This film is a poignant look at the life and times of the olive ridley. Tens of thousands of these sea turtles visit the coast of Orissa, in India, every year to mate and nest. As a species, they have been around for millions of years, but today these gentle giants of the sea are in conflict with man. The film provides rare insights into the natural history and conservation of these mysterious creatures. Will the ridley go the way of the dodo and the passenger pigeon? Or, can we save it with timely action? Asia’s largest brackish water lake, Chilika, in the eastern Indian state of Odisha, was considered a dying wetland until the late 1990s. But thanks to scientific restoration by the Chilika Development Authority (CDA), it is now once again a vibrant refuge for wildlife and a reliable source of livelihood for local communities. Discover why India’s beaches are eroding at an alarming rate, and what can be done to stop this disaster from spreading further. 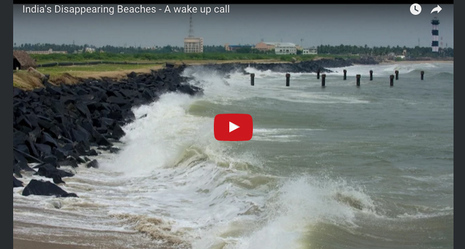 Saving India’s disappearing beaches is everyone’s business, and the movement begins here.